In March 2007, local officials, law enforcement and dignitaries celebrated the opening of the Nocatee Parkway, a roadway that stretches from the Intracoastal Waterways to U.S. 1 and serves as the main thoroughfare through the coastal community of neighborhoods. Do you remember this day in Nocatee history??? To learn more about the vibrant community's new roadways, amenities and neigborhoods, utilize Nocatee's interactive Explore Nocatee tool. 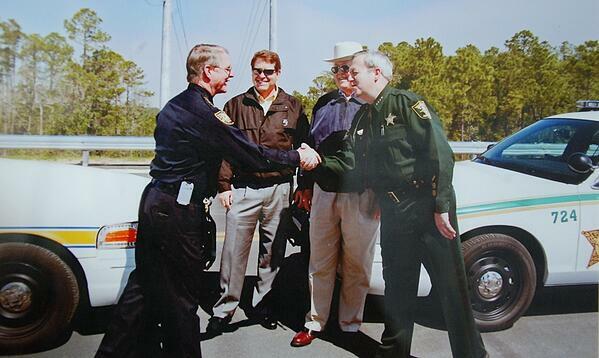 *Jacksonville Sheriff, John Rutherford, and St. Johns County Sheriff, David Shoar, shake hands during the 2007 Nocatee Parkway Road-Opening Ceremony.